Weblinks keep your most frequently visited websites with-in few clicks away. You can save a website you visit the most throughout your day and create a weblink for it, which can allow you to visit the website with just one click. 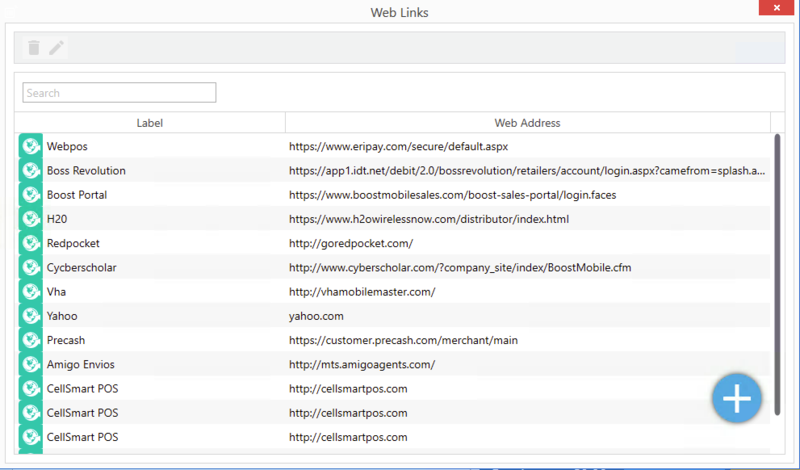 By entering the address of the website inside the weblink module you can create many weblinks within the software and save time. Click on the Weblinks Tab. Click on the Weblink Customize button. It will open a window with a list of your previously created weblinks. Click on the Blue plus icon to create a new weblink. Enter the label of the link so its easier for you to identify when clicking on it. For example: Boostmobile. If you visit the Boost Mobile website frequently. Enter the web address of the website in web address field. Select the icon of the weblink for identification purposes by clicking on the Select icon button and selecting an icon. Click save to add the weblink. From the list of the Weblinks appearing under the tab, click on the weblink you want to select. Your browser will open up that webpage for you, without you having to enter the address.